'It's all gone,' says mother of three whose home was hit in Gaza rocket attack. 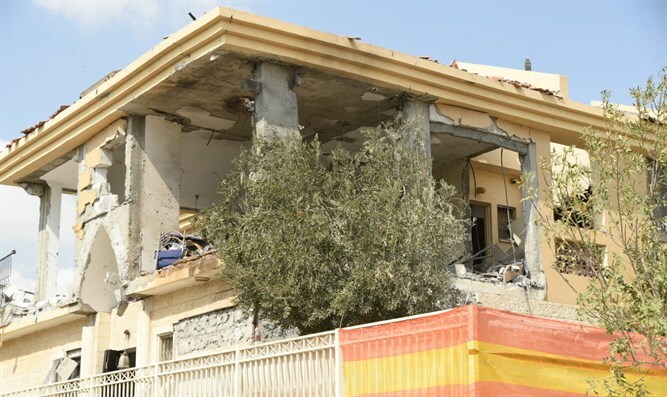 Hours after a powerful rocket fired from the Gaza Strip into Israel struck a private home in the southern city of Beer Sheva, the now homeless family which resided in the now destroyed house is calling on the public to help them rebuild their lives. Tamano said her family was left without even the bare essentials, and would need help from the public. The family will be staying in a hotel while repairs are made to the house. Tamano and her three children were treated for shock after the rocket landed next to their house, but were saved from far more serious injury by the fact that Tamano had rushed the family into a specially fortified shelter room. The rocket was fired overnight by terrorists operating in the Hamas-ruled Gaza Strip. The IDF attributed the rocket attack to the Hamas terror organization, a claim denied by Hamas leaders. Hours after the attack, Israeli fighter jets attacked 20 terrorist positions across the Gaza Strip, killing at least one terrorist.